The nine supermarkets included in the study, which is published in PLOS Medicine, were Aldi, Asda, Co-op, Lidl, M&S, Morrisons, Sainsbury's, Tesco and Waitrose. Data from another 7,500 shoppers who recorded any food they had purchased at supermarkets to eat "on-the-go" rather than take home, showed an even bigger decrease. She said: "It's really heartening that small changes in supermarket layout could make such a difference and have an impact on people's diets." 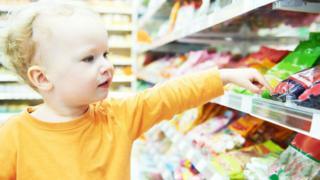 Supermarkets have been accused of using "pester power" to sell food high in fat, salt or sugar by putting crisps, sweets and chocolates at the checkout for young children to see and then want. Dr Adams said these purchases were not necessarily parents giving in to their children. "Sometimes parents buy them as a reward for their child having behaved well in the supermarket." Dr Alison Tedstone, chief nutritionist at Public Health England, said: "You would have to be superhuman to resist some promotions. They appear to offer great value but they're actually designed to make us spend more on foods we simply don't need. "Restricting promotions would help to tackle excess calories and reduce obesity, while saving us money over time." The government's ambition to end the promotion of unhealthy foods and drinks at checkouts is part of its strategy to halve childhood obesity in England in the next 12 years. A Department of Health and Social Care spokesperson said: "This research supports what parents have been saying all along - check-out deals for sugary and fatty foods mean they end up buying products they don't need or want. That is why we will soon be consulting on restricting these types of offers."